I particularly like comics about the apocalypse. What I mean by that is that I really like comics in which the world of the comic ends in some dramatic way. More than that, I like when we get to see the full implications of the ending of that world. So what I am talking about is stuff like Kindt’s Revolver or Ennis’ Crossed. I think that is also the reason why The Walking Dead shines as a comic and fails miserably as a t.v. series; the comic is only a meditation on society–the zombies are just backdrop. In any case, in a moment of rare spare time, I read two comics today: Mignola’s The Doom That Came to Gotham and Warren Ellis’ Ruins. The first is a retelling of the Batman mythos as if it started during the early 20th century and was written by Lovecraft. The Ellis comic was about a world in which Victor von Doom pilots the Fantastic Four ship instead of Ben Grimm. Because of that, the entire history of the Marvel Universe changes. In any case, both are “apocalyptic” in different ways. The Batman comic is so because Bruce Wayne realizes that the only reason he exists is to defeat a Thing from beyond time–it is truly apocalyptic comic in the classical sense of the word. The narrative of Wayne’s life is suddenly revealed to have a pure, absolute purpose. Ruins is apocalyptic in that it shows us how a comic book universe can be absent meaning–it can be robbed of its magical qualities, be horrifying, be dead/alive. I think that comic book apocalypses are something that comics do better than realistic fiction. An apocalyptic narrative that has a root in our world has a certain kind of psychology attached to it–there is the sadness of a whole world, a world that we know while reading, that is totally lost, and more importantly, meaningless. The affective work that The Road achieves is like this; there is a beautiful moment where a child drinks a Coke, for example. Things stop meaning in a realistic apocalypse, and the gap between what we know and what is written is where the horror comes in. But that isn’t what is really going on in comic book apocalypses. We don’t have that same kind of mental process–the gap cannot appear. Instead, it becomes one world among many. There is a reason that so many Elseworlds and What If? titles are all about the death of their respective universes. They become equal fiction, a world in which something that could have occured did not, or taking it back even further, a world that is wholly different and practically unrelated to the comic book universe that we are familiar with. The picture below this is from Ruins. 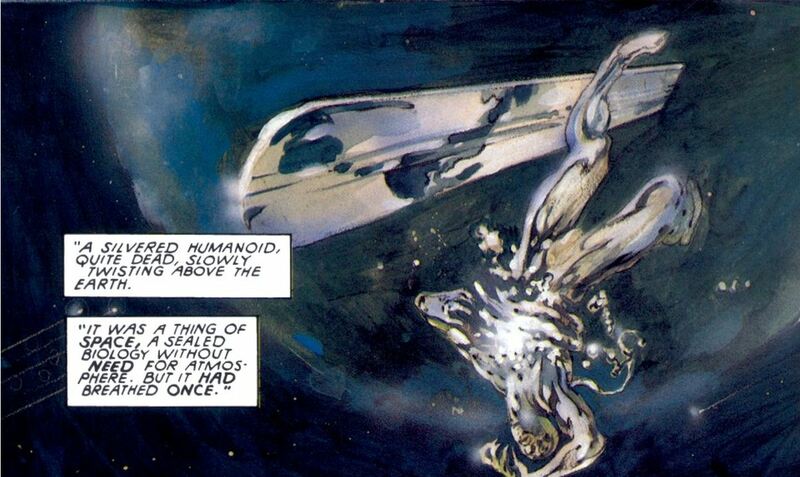 It shows a Silver Surfer who, after surveying the Earth, commits suicide. It is literally an abortive narrative–the Silver Surfer is a herald of Galactus, and if he had not died, would have ushered in a major comics plotline. So what is interesting is that this is a dead end, a case of writer’s block, an aporia that we are faced with. The characters in the comic do not know about it, or what it means, but we can understand that. There is a weird appeal to a true narrative here, a way that a Marvel universe is supposed to be, even though there is no “true” one. Collectively we have decided that a world where Captain America is a hero is the best world, the true world, even though Marvel have relaunched their line numerous times. I think there is a communal affect that is going on here. The way that the affect of the comics impact and draw people together creates a community. It is a community that I’m not really pleased with, but nonetheless, they are doing something together and they are brought there by their shared love of fiction. This is also the way that we get violent shared affective experiences–fashion culture works in fundamentally the same way. I guess what I am getting at here is that there is something really great about a genre that invites us to think through questions of ending and destruction where we don’t have to experience a horrifying nostalgia for a lost world. Apocalypse comics are strange–we are invested in the world that is ending, but not in any real way. Both narratives are equally plausible, equally real. Maybe that is why Warren Ellis’ Planetary is so great to me–it’s an archaeology of comics, a place that helps us read the infinite dead worlds that are out there. This entry was posted in Comics, General Features and tagged apocalypse, batman, comic books, comics, warren ellis. Bookmark the permalink.